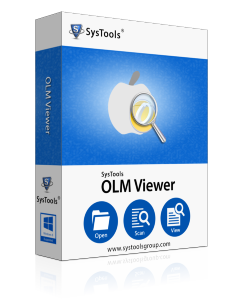 OLM viewer software offers to open OLM file without Mac Outlook i.e providing global support to Windows OS. 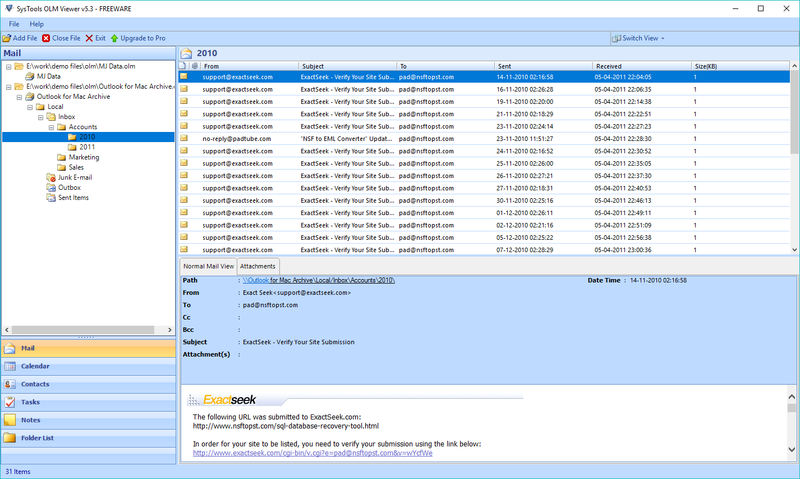 It provides simple GUI for reading Mac Outlook files along with the entire email data. This free OLM file opener tool also maintains the quality of mail items even after the scanning that means no alteration of original data takes place. Since, OLM file is not supported on Windows platform. 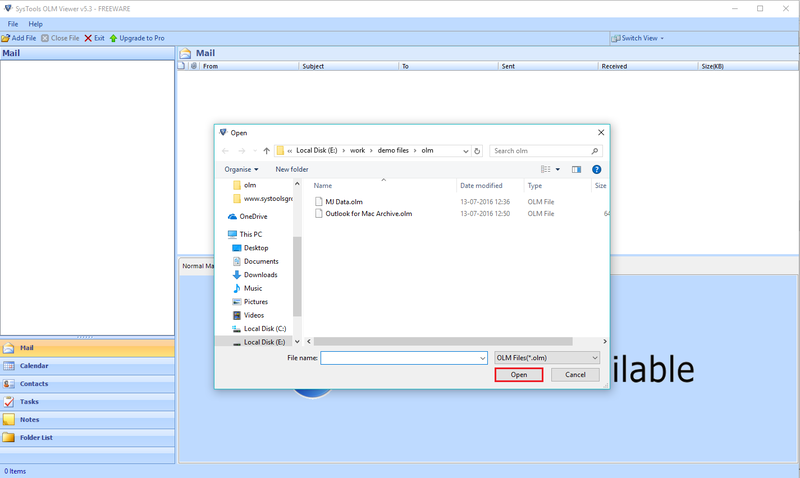 If you are in need of opening OLM files on Windows machine without Outlook. Then, You are on right track with free OLM Viewer to open OLM file without missing any data. It is not possible to have a doubt in your mind regarding attachments of the OLM file. This software application makes it possible to view the attachments along with calendars, tasks, contacts and notes. The tool is not limited with providing the view of single OLM file. One can open multiple OLM files without any limitation on the size of OLM file. However, You need to add multiple OLM files one by one using the "Add File" button. The entire details associated with each data item remains unaltered. There will not be loss of any email attachment, calendars' alerts, appointments, time, date etc. The contact information with contact numbers, email addresses, contact details and scheduled tasks will also be viewed by the software. 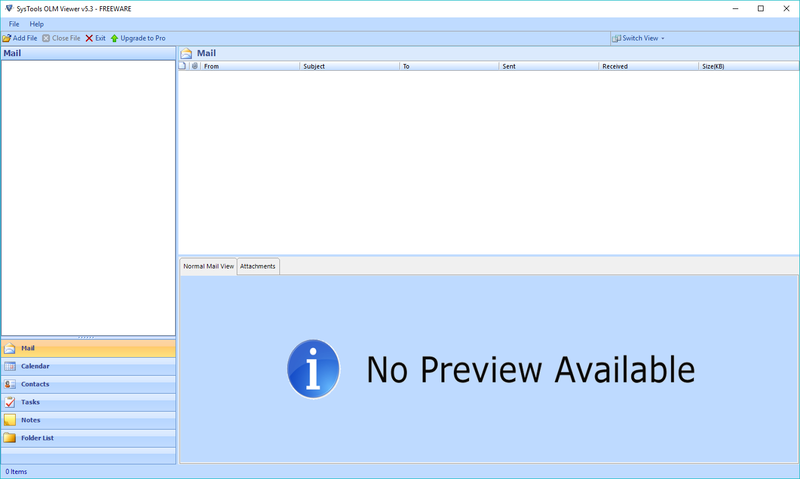 The software possess a user friendly interface similar to Outlook. So, that you will not face any difficulty in the entire process. There is no need of extra technical knowledge to operate the software application. The tool provides the facility to scan and load the whole data of OLM file. OLM Viewer is capable enough to perform all the required tasks, does not require extra installation of any software or email application. So, this standalone application simplifies the task even for a novice user. 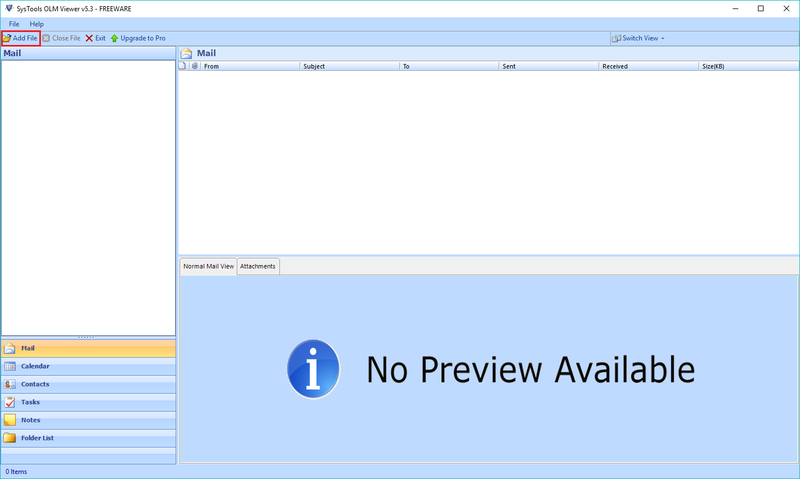 You can easily view the OLM file of Outlook 2011/ 2016 for MAC. Stamp of Approval By Esteemed Users..
My heartiest thanks to the OLM file viewer software that helped me to get an answer as how to view MAC email online easily. I needed an importer OLM mail Mac to Outlook 2016. I spotted your free OLM reader and downloaded it to read OLM emails in Windows XP. Within few simple steps, I was able to read the entire content of the OLM files with attachments. I was not receiving email in Outlook 2011 for mac due to installation of an application that contained virus. Your free OLM viewer helped me out in reading my OLM files in Windows in just three simple steps. OLM freeware XP 2007 reader is an amazing tool. It just resolved my problem free of cost. I was looking out for a free tool to download that can move OLM file then suddenly I spotted OLM reader tool that allowed me to read OLM emails in Windows platform free of cost. 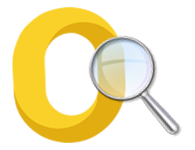 I utilized the tool for viewing Mac OLM files and it was effective tool. This tool, which is so simple to use and that to available free of cost for life time. This tool is a precious gift by the company to the users. Thanks a lot. I searched out for Mac Outlook data file online but I only recovered the demo version for free Mac Outlook tranforamtion that has restrictions. I needed a tool to read my OLM files and I was happy to spot out your OLM Viewer tool that allowed me to view my OLM data files on Windows platform, which I could use forever. My search for OLM extraction tool for free download did not gave me satisfactory results. But when I found free OLM viewer tool, my problem was almost reduced to half as could read my emails in Windows environment at urgent time. © 2007-2017 www.olmviewer.com | All Rights Reserved.